HARTFORD, CT -- (MARKET WIRE) -- December 7, 2005 -- Urinary incontinence plagues women in increasing numbers as they age, afflicting an estimated 17 million Americans. Childbirth and declining estrogen levels play a part. When exercise, lifestyle changes and medications have failed, surgery used to be the best option. 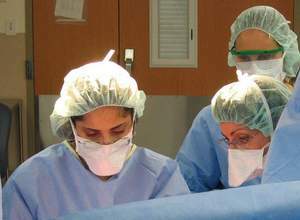 Now the condition can be treated with a simple outpatient procedure known as "TVT," or tension-free vaginal tape system. Patients go home the same day and some patients are back at work in a week. Watch Hartford Hospital physicians perform a live TVT procedure in this webcast, the 17th in the Hartford Hospital series. Join Urogynecologists Christine LaSala, MD and Paul Tulikangas, MD at 6:00 PM ET (23:00 UTC). Viewers will have the unique opportunity to email their questions directly to OR for a live, on-camera response. In the November 7th issue of Best Practice & Research Clinical Obstetrics & Gynaecology, researchers at Kingston University Hospital, Surrey, UK report: "The tension-free vaginal tape (TVT) has probably had the largest impact on incontinence surgery in recent years, offering a procedure with low morbidity and, thus far in the medium term, outcomes comparable with those of more invasive procedures. This has led the TVT procedure to become the most common procedure performed worldwide for stress incontinence." Join Join Urogynecologists Christine LaSala, MD and Paul Tulikangas, MD<br> at 6:00 PM ET Dec 7th, for a live tension-free vaginal tape procedure<br>for urinary incontinence from Hartford Hospital.